A 5 tiered extravaganza! 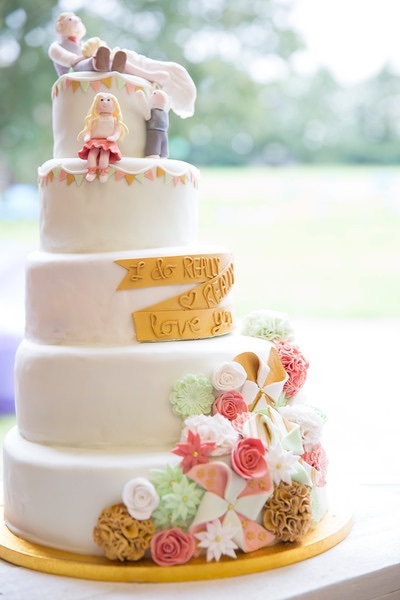 All tiers are different flavours and the cake is decorated in the wedding colours with the fete theme. the top 2 tiers are a very subtle mint green with bunting, the happy couple sitting on top in their wedding outfits and their 2 lovely children wearing their wedding outfits. The middle tier is white with a gold banner saying ‘ i do really really love you’. the bottom 2 tiers are the subtle mint green again decorated with cascading pinwheels, pom poms, roses and other flowers all in the wedding colours: coral, mint green and gold. needless to say everything is 100% edible and hand made by me!